This weeks’ Forgiveness Friday focuses on forgiveness of the small things. Many times in relationships we allow little things to slip into the arena of unforgiveness within our minds. When your spouse forgets to make the bed up and rushes out the door without giving you a kiss goodbye, it is then you need to choose to forgive. When your friend forgets an appointment with you, it is then you need to choose to forgive. When your books don’t come in on time for the first day of class, it is then you need to choose to forgive. Way too often we think that forgiveness is solely reserved for something, which involves deceitfulness, betrayal, or any other life changing event. But, the truth is forgiveness is for everything, including the small things. When you choose to forgive the small things, you’re choosing to release the ability for small things to add up to a huge explosion of laired unforgiveness. Make a point to be consciously aware of the small things that are in need of forgiveness within your life. A resumé remains the most acceptable means of self-promotion, alongside having a hype man lead call-and-response chants about your GPA. Make an first-time impression with a great resume package. Jenice Armstead, has over a decade of experience helping job applicants pin point what hiring managers are looking for in their resume. After submitting a current resumé and filling out a questionnaire on career goals and accomplishments, applicants work one-on-one with a writer to craft a resumé that’s clear, concise, and attractive to interviewers. This business expert also boost clients’ chances of getting hired with extra-mile services, such as O*Net job descriptions, job analysis and creating possible job descriptions for the clients. Professional writers increase your chances of employment by creating a smart new resumé targeted to specific employers. Are you frustrated and in-patient? Why is that? Do you feel that you should be in a position or financial place that you feel you are not currently? Why is that? Take some time to realize that you have “gifts” that you can do naturally. Instead of being and doing what you think you should do, take some time to think about what makes you truly happy. When am I truly happy professionally? When was the last time I did those things? How can I embrace the “true being” of myself and grow professionally? Set a goal and work toward it. Have you ever noticed when you are “feeling” good about yourself, you tend to be more selfish than when you aren’t? That is because feelings are fickle. Feelings come and go with the wind. One minute you can feel happy, and the very next minute you can feel sad. This is because feelings are an aspect of what we “think” is happing to us. Instead of letting your feelings rule you, make a point to be aware of your feelings when they suddenly change. Take a moment to self reflect to see if you have done something that your Spirit or Higher Self has disagreed with. Did you act badly in traffic? Did you not respond to a “good morning” from a friendly stranger? Did you wake up and start saying hurtful things to your loved ones? No matter the situation, make a point to try and self reflect in the situation and evaluate why you are feeling the way you are. You will be surprised at what you may learn about yourself. When you believe in something, love, desire, and want it, you can create it more quickly. One thing you have to do is not allow the emotions of others to drain you. As you calm your emotions, you will be able to handle other people’s strong emotions. When you think about it emotions are how you know whether you like or dislike something. Your emotions are the key to understanding your environment and how you choose to react to it. When you think about something on a continuum basis you allow it to come into your life faster than it would if you weren’t thinking of it. It isn’t something that can be controlled, unless you choose to do so. It is true. I can remember thinking about not wanting to have a bad day and in fact drawing situations to me that actually caused me to have a bad day. In the moment you are thinking about it, you don’t realize what you’re doing – unless you choose to understand what you’re doing. You are affected by others and their emotions – whether it is a positive or a negative way. You choose what to transcend from others emotions. You are in total control of your emotions and what you absorb. The key is to calm yourself and not allow others emotions to become your emotions through default. When you “feel” something, the first thing you should do is take a second to analysis why you are “feeling” the way you are. If you are feeling sad, happy, excited or reserved, remember that your environment is a contributing factor to your feelings. You have control of how you respond to your feelings. We have the ability to be reactive in a negative way or a positive way. Be careful to not let “feelings” rule your life. You have the power of self-control. Are you looking for more interview guidance that will actually work and get you that job? There are a few key items that must be taken into careful thought. It is important to realize that in today’s job market you must have some type of people skills. You must know how to have a conversation with just about anyone at just about any time. The truth of the matter is that today’s job market is full of unconventional opportunities. You must be ready for any type of interview, at all times. You have to be personable, approachable and presentable at all times. When I say all times, I mean at ALL times. For example, while shopping for groceries in a super market you could be approached by a random person that strikes up small talk with you, and before you know it you find yourself in a “mini interview” situation. You could even have a small conversation with someone at a gas station. Gas station!? You ask? I say with great affirmation, YES! You could have a “mini interview” even at a gas station. Managers and recruiters are everywhere. It is a good practice to keep business cards and resumes with you at all times. I have business cards for just about everything, including when I meet a new friend and want to exchange information with them. I have a business card for my academics, photography business and for my personal websites. You must always be ready for the unexpected interview or networking opportunity anywhere, with anyone and in any situation at all times. This is one of the reasons why I have created these easy to use and follow booklets. With the Pep Talks Book Series, you can be ready at all times. With helpful inside, interview tips and advice, examples and interactive questions to help with the interview process toward getting the position that you have been dreaming of. 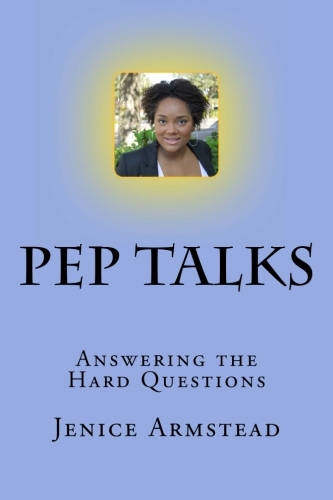 You have just opened “unseen” doors for yourself, and your interviewing skill sets will improve with using the Pep Talks Book Series. An attitude of gratitude is more important to your physical health than you may realize. During this time of year, it is important to show gratitude for what, who and all of the blessings that you have. Gratefulness is contagious, show gratitude and you will be given more. How can you expect anything good to happen if you don’t have gratitude for what you have currently? You can always find something to be grateful for. No matter your situation, you can always be grateful. Make a “Grateful List” and keep it to remind yourself of all that you are grateful for. Here are a list of items I am grateful for each and every day, with this list you can add to it or change it to suit your personal goals in life or things that are most important to you. Decide what you want from life, believe you can achieve it, and focus. Believe that you can have it, and know that you deserve it. Close your eyes several times a day and focus on having it. Visualize having it and feel grateful for having it right now. When you take the time to believe, receiving and achieving you will start to be more optimistic about your life. In an economy where you must “find a way or make a way,” it is important to understand your professional value. We all bring different attributes to “the table” when it comes to our field of choice, what we are good at and what we love to do. What are you good at? Take some time to find out. It is important to spend some quality time finding out what you are good at and what you are not so good at. One of the best ways to do this is to simply try. That simple word, “Try!” Has been used many times in the negative condensation that it is perceived as a “bad word.” How may times have you heard someone or yourself saying “At least I tried! ?” That gives the impression that it was all you could do. It is saying of defeat, when that is not the case at all. Succeeding isn’t in the “trying” it is in the “doing.” It is in the “doing” that you find out what you are good at. Doing is how you find out if you have a natural gift for something, or if you need to practice. People that are good at what they do, either have a gift or have to practice. Either way, it is in the doing that they are truly successful. The key to success is in failing and then finding yourself. Failure is not a bad thing, it allows for you to see how you can improve yourself. Step out and find out, it is time to do more than try. It is time to do! Be careful not to complain in your thinking, doing and being. Complaining is a form of being stagnate in yourself. When you complain about something or someone, you are giving into the “lower” part of yourself. Instead of complaining about a situation or person, take some a moment to reflect on the good things about the situation or person. For example, if you are at a job that doesn’t pay enough you can take a few moments to write down all the things you are grateful about within the job. Such as, the knowing you have enough to eat and provide. If you have a complaint about your spouse not doing enough to help around the house you could make a list about all the wonderful qualities that made you fall in love with your spouse in the beginning of your relationship. You may find that by taking a few moments to reflect on the situation or person that you are the one that causing the “friction.” It could be as simple as changing your attitude in the moment you are complaining. Your attitude has more to do with how you feel and react to a situation or person than you may think. With the “thankful lists” that you make, keep it handing when you start to complain. Sit down and read the list aloud. Take a moment; reflect on the situation and how you can make it better with some “self-realizations.” In all things, “give thanks” because there is always something good you can be thankful for in any and all situations. • Am I being kind to myself in this moment? • Is this necessary to do? • Does this situation make me whole? • Is this true of my core self? When asking yourself these questions remember that each situation in your life is not about how you act, but rather how you react to it. The best way to not draw offense from any situation is to find clarity from within. Speak aloud some positive affirmations about yourself such as “I am a kind person, I am a person of truth or I have the ability to overcome this situation and come up higher.” The ability to “self talk” in a positive manner can determine your ability to see the challenge as a benefit instead of a hindrance. Being mindful of yourself is the first step toward growing and becoming a better person. You will make mistakes, because you are human. It is okay to take a moment and gain clarity in a world full of challenges.